Go to the homepage of StudentSites and click the big “Create Site” button on the bottom of the page. Then fill out the StudentSite form. Below you will find suggestions and help on how to fill out the form. The Site Title allows you to properly title your new site. The Site Title appears at the top of the site and can include upper case letters and punctuation. The Site Title should tell the reader what the site is about. Continuing the example from the Site Name the Site Title might include “Johnny Smith’s Biology Journal”. If you are new to using a blogging platform you should know that StudentSites is built using WordPress. Dearborn Public Schools operates our own WordPress Publishing Platform just for you. All sites are private and you must login to view sites. Once you create your own StudentSite you will want to go to the site’s Dashboard. On the Dashboard you will find a link for Video Tutorials. 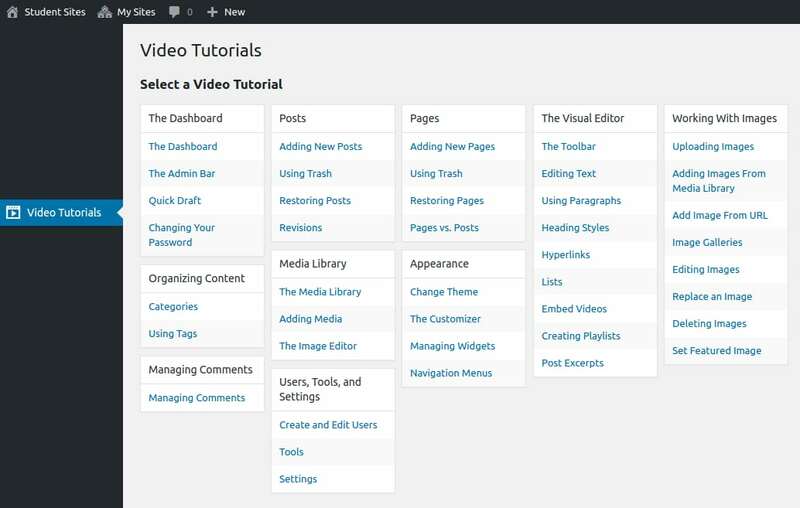 These will help you better understand how to use WordPress and StudentSites. What’s the Difference Between a Post and Page?